Enjoy some relaxing time with your friends while you experience our variety of shisha at our shisha bar! Call (775) 580-7221 today for specials! It seems as though there is never enough hours in the day. With our busy schedules, we don’t have enough time for the simple pleasures in life. Well, it’s time for a change. It’s time to start living and enjoying the company of old friends and meeting some new ones. 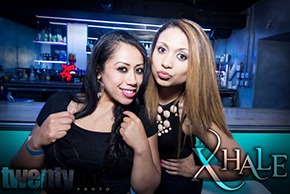 Come experience the good times at Xhale Bar & Lounge! Since opening our doors in May, 2014, we have had a spectacular crowd from the Lake Tahoe, CA area. Crowds of all kinds; single people, married couples, bachelors/bachelorettes, and after work crowds have come to Xhale Bar & Lounge to experience the excitement. If you don’t know what “hookah” is, it’s time you find out at Xhale Bar & Lounge. Hookah is the latest craze that has been taking the nightclub and bar scene into overdrive. Hookah is a water pipe that is used to smoke specially made tobacco. A drink and a hookah goes hand in hand! While you’re at Xhale Bar & Lounge, get your groove on with a live DJ. Show off your dance skills dancing the night away to the latest hits. We offer your favorite name brand drinks and a variety of hookah flavors to keep you coming back to the Xhale Bar & Lounge for more! No more long lines to stand in for a drink and no more unfriendly staff. Get your dancing shoes on, come mingle with our staff and meet us for a drink or two at the newest hookah lounge in Lake Tahoe, CA, Xhale Bar & Lounge. Can’t wait to see you there!